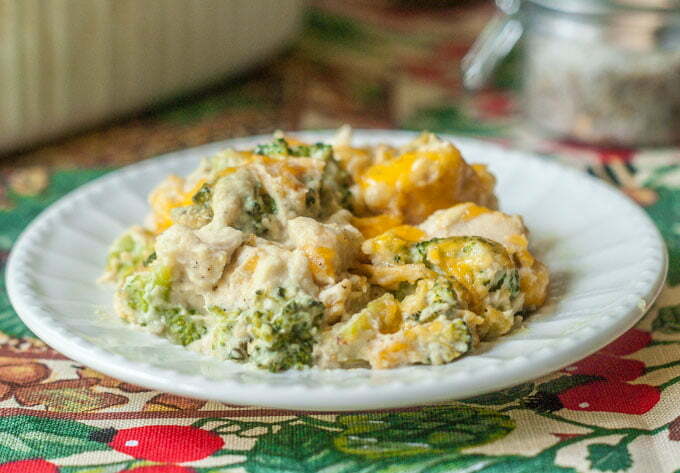 This low carb chicken broccoli casserole uses a cauliflower cream sauce for a healthier dish. This comforting casserole is tasty and easy to make. Only 5.4g net carbs per serving. I think everyone is familiar with cauliflower as a cream sauce these days, but incase you aren’t, here is how you make it. I like to add florets to a pan and just about cover with water. Then when the cauliflower is fork tender, I drain and reserve the cooking liquid. The cauliflower goes into a high speed blender along with some olive oil and spices (like nutritional yeast for a cheesy flavor) and you blend on high until it’s smooth and creamy. If it’s too thick you then add the reserved cooking liquid a bit at a time. Above is an old photo I took for my Paleo Chicken Pot Pie Soup. The rest of the recipe is fairly simple. I microwaved the broccoli in the microwave for 4 minutes because everything else in the dish is cooked. So once that is done, just mix it with the chopped, cooked chicken and cauliflower cream sauce. Top with cheddar cheese and bake for 20 minutes. I hope you like this dish as much as I did and if you have any questions, just leave me a comment. And for more healthy low carb recipes check out our new Facebook group. 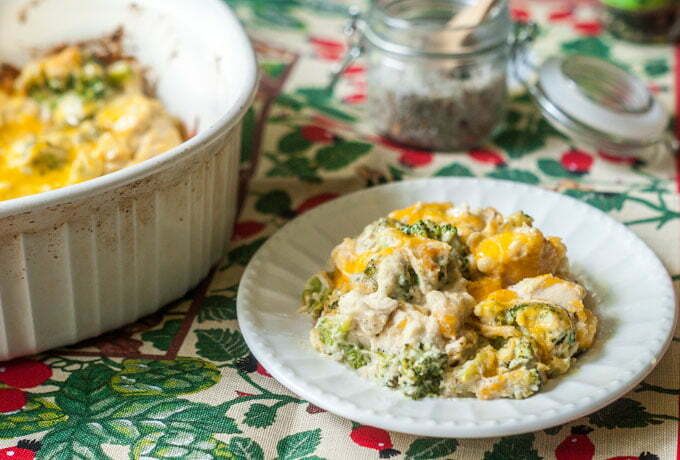 This low carb chicken broccoli casserole uses a cauliflower cream sauce for a healthier dish. 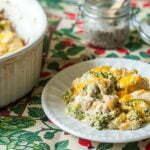 If you are looking for low carb chicken recipes this chicken casserole has only 5.4g net carbs per serving. In a pot, add the cauliflower and just about cover florets with water. Cook until the cauliflower can be pierced with a fork. Meanwhile microwave the broccoli for 4 minutes. Add broccoli and chicken to a large bowl. When the cauliflower is done, strain but save the water in case your sauce is too thick. Add the cauliflower, olive oil, nutritional yeast and spices to a high speed blender and blend until smooth. You may need to add a bit of the cooking water to thin it out. 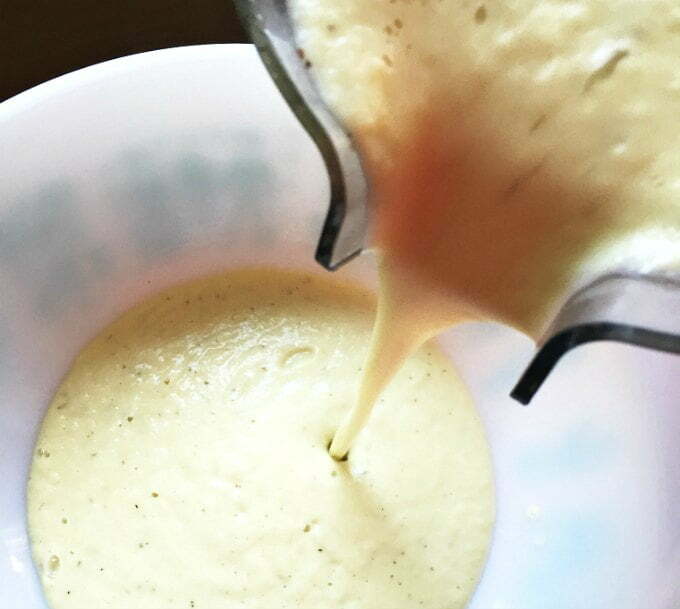 You want it to be the consistency of a sauce and not mashed potatoes. 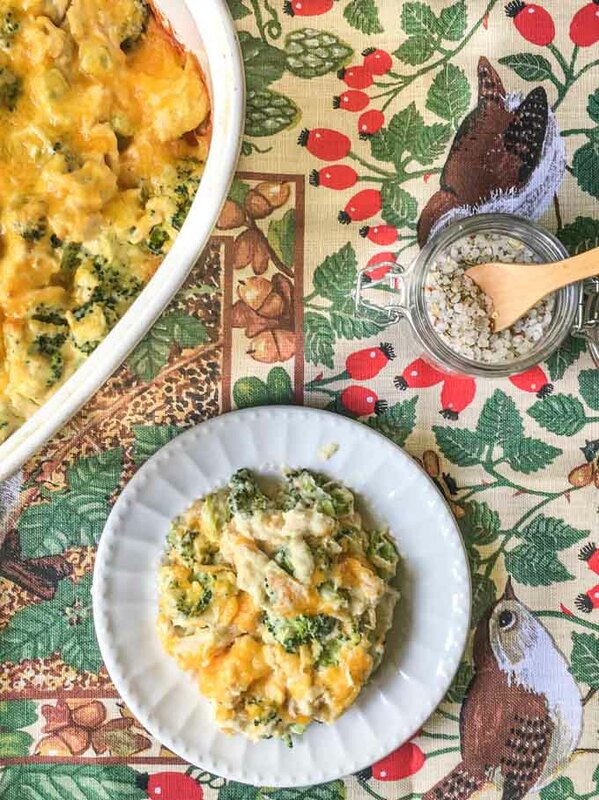 Mix the cauliflower cream with the chicken and broccoli and spoon into a baking dish. Top with shredded cheese and bake for 20 minutes. Made this last night and the hubby asked that I make another for the next day as we ended up eating the whole thing in one night. I was fine to oblige his request as it was so simple and quick! VERY TASTY RECIPE. The first go round my cauliflower sauce was too thin. The second time I made it a tiny bit thicker as it seemed to have a bit of water after baking. The second one also got to sit in the fridge overnight to thicken up as well. The next day flavor was even better. I subbed turkey breast (thick slices from the deli that I cubed and used), and added mushrooms to the mix (had leftover in the fridge that needed a home). I will definitely keep this recipe in rotation. Thanks! Hi Joh, that’s funny you say that about it being better the next day because I noticed that I liked it more after it was frozen! You additions sound great….especially the mushrooms. Thanks for taking the time to come back and comment! I’m not sure if I put too much of the cauliflower water or what but after a day or so in the fridge it makes me feel like puking. I’m sorry to hear that Steve. Sometimes cruciferous vegetable have that unappetizing smell in the refrigerator. Hey! Would I be able to make this ahead and freeze it? I believe I did freeze this and just microwaved it. However I did this in portions. Not sure how the whole casserole would work. Hope that helps! Hello, I don’t want to make the cauliflower cream sauce, because I don’t like working with cauliflower. Can I make substitutions, or just a regular cream sauce – and if so, how? Hi Sharon, that is a tough one. From a low carb perspective, cream would be fine but I would add some cheese or something that will thicken it because it might be runny. The cauliflower bulks up the sauce. Maybe try to make a sauce of cream cheese, heavy cream cheddar or Parmesan cheese. Mix that in with the chicken and broccoli and bake. Good luck! As a pre-diabetic, this recipe seems to be very healthy to eat. Do you use fresh or frozen cauliflower and broccoli? If fresh broccoli, does any water need to added in the dish for steam? Can’t wait to try … looks delicious! I used fresh broccoli but you can use frozen if you wish. I use a microwave pot and usually I rinse the broccoli in it so there is some water, but not much. Then I drain it before using in the casserole. I hope that makes sense. Let me know if you have any other questions and I hope you like it! I just made this and it was sooooooo good!! Thank you Julie! So glad you liked it. And thank you for taking the time to come back and comment. Have a great weekend! As some others said, I too used a little of the chicken drippings to thin the consistency of the sauce. This is a delicious recipe! Might try crumbling up some bacon in it this round. That sounds pretty awesome. I haven’t made this for a while but I’ll have to try that! Do you find the sauce to be thick like a traditional cream of soup? Does the final dish bake up runny or does it set well? Thank you! I found it to be thick myself. I actually would like it to have been a bit thinner. It did not loosen up after baking. I hope that helps. Maybe someone else will chime in. I even froze it and it was good to me. Hope that helps! Hi Andrew, yes the chicken is precooked. I used rotisserie chicken. Often I will buy one, take all the meat off of it and freeze it for recipes like this or soup. Hope that helps! This is REALLY good! I made it without the nutritional yeast (as I didn’t have any) and put the juice from the cooked chicken breast (frying pan, lid on) in the cauliflower mash along with the cheese. Thank you very much for this recipe – I will be making this many times. So tasty. Hi Julia, so glad you liked it! I will have to try that with the chicken juice… I bet that added even more flavor. Hi! Do you o ow about how much is one serving? If the entire dish is 4 servings, I’m going to guess quite a bit. Around 1 cup maybe? Thanks! Hi Brittany, I am guessing at this and I agree it would be about 1 cup. Hope that helps! I cooked this for dinner last night, and was extremely impressed. I’ve been on a low carb and low calorie diet now for the past 2.5 months, and this is something was was PERFECT for my diet! Thanks for sharing this recipe! I was very happy with it, and will be making this more often. Thanks so much for writing Christine! That made my day!